Writing is a good way to stretch vocabulary development. As students struggle to find a perfect word they may try out words on the edge of their understanding. This effort to find the right word can lead to conversations about why or why not that new word works in that context. These conversations can lead to other new words to try. Writing is an important component of language building. This prereading activity also makes a great prewriting activity. List all of the words you can think of that are related to the topic. Once you have created your list, group the words based on their similarities. Label each group when you are finished. Students can then write a paragraph from the ideas for each label. When used as a prewriting strategy, this activity helps students organize prior knowledge, as well as try out new words for writing and/or have conversations about needed words that are not clearly known or understood. I have created a Summer Writing Flapbook to keep my students engaged in writing throughout the summer. It has 32 small writing tasks, so maybe every three days they can stop for a short while and write. The prompts include lists, research, fiction, narrative, and research writing. They also have a choice in what they write. The June page has the option of a father and son silhouette instead of father and daughter. It also has the option of a “My Hero” writing for students who don’t celebrate Father’s Day. Each month has a calendar for students to circle, then write about, important dates in their lives. All of the pages in the Summer Writing Flapbook are also included in black and white. Do you have any summer writing ideas that you would like to share? Students need to be able to share during all stages of writing including prewriting, development, or revising. Peer conferences will work best if you have an established routine with explicit instructions. Students also need to be held accountable for their performance. When starting peer conferences, you need to set the stage. The activity needs to be structured. You need to decide on the size of the groups; pairs, small group, or writing teams. You need to decide if the feedback will be oral or written. In my third grade classroom the students will be in pairs and will work orally. If I have an odd number of students there will be one triad or one student conferring with me. The students also need to be held accountable for their discussion. Depending on the day, either one or both partners might share their writing. If there is only time for one, then the next day the other would share. As with all classroom activities, students will need trained on this procedure. Start by modeling what a good conference will look like and sound like. I will be as detailed as to show them how to sit facing each other, how to use names when asking the questions, and how to establish eye contact. Students need support to be able to do this effectively. You could create a guidesheet for different types of writing; personal narrative, expository, persuasive, and any other type. I use 5 – 6 posted questions for the “interviewer” and sentence stems for the writers. I ask my writers to answer in complete sentences using one of the stems or their own thoughts. We practice using sentence stems in other activities throughout the day. This helps the students learn to use correct sentence structure and to academic language and to use it appropriately. The “interviewer” or reviewer needs to be able to give good feedback. A basic TAG formula is one way to establish this. T is for “tell something you liked”, A reminds the students to “ask a question” and G means “give a suggestion”. I have seen posters with Star, Star, Wish. Which asks the students to share 2 positives and a wish for improvement. Another idea is to ask the interviewer to point out one good part and tell what makes it good, ask one question, and point out a place where they’d like to know more. The “interviewer” can mirror back what was heard to help the writer focus on what the “audience” is getting from the piece. During the conference students could be equipped with three different colored highlighters. They would then look for evidence of specific kinds of content, for example vivid verbs, details, transition words, even misspellings. These could actually be chosen in response to the writer’s specific needs at that time. Unfortunately, these conferences need to be quick so that writers can return to their work. I plan to give no more than seven minutes a day to peer conferencing. I am hopeful that it will be a part of most days when we have writers workshop. In addition to my observations and assistance with the process, one way the students will be held accountable is when they come to conference with me. I will ask them about their peer conferences as well as look for and listen for evidence of its benefit. If you want to see more details about my program, I have 7 different formats available for my Peer Conferencing product. I am now working on some “Inspirational Quotes” about Writing. I can’t wait to share them. A freebie should be available soon. Blogging is best learned by blogging…and by reading other bloggers. And so a person who blogs is a blogger, although they might have been a bloggor, a bloggist, a bloggant, a bloggart or even a bloggarian. And who is the bloggee? The person writing or the person reading? Who decides with brand new words? How do they grow and become recognized so quickly? While working on a product on suffixes, I started noticing all of the suffixes that mean a”a person who”. I had never thought about servant having a suffix and meaning “a person who serves”. Yet here comes to mind immigrant, inhabitant, celebrant, participant, already to taunt me for not seeing them before. Do I think learning all of these word endings would be beneficial to my little people (third graders)? Yes, I do. If by learning, I mean being exposed to, playing with, talking about. No, I don’t. If by learning I mean drilling and testing. How about an example/non-example lesson. Have a list of maybe 20 words with suffixes. Be sure about half of them have suffixes that mean “a person who” (teacher, walker, artist, scientist, inventor, translator, librarian, vegetarian, contestant, defendant…). Start making two lists, students pay attention to the words to determine why they are examples or non-examples. A “find an ending” matching game could be fun and would involve movement and discussion in the classroom. Half the students would have a card with a root word and the other half have a suffix meaning “a person who”. They link up with a partner when their two word parts create a “person” noun. They could then share the word and how they knew it was a good word with the class. This chart is be a part of my Suffix Scavenger Hunt. Click on the poster for a link. Don’t forget it is Fabulous Flash Freebie Sunday! They will be announced on my Facebook page. https://www.facebook.com/home.php?sk=lf I have also added a Freebies for Fans button on my Facebook page and have added a free gift for my followers. I think I want to be a bloggart. It seems like I could be a blogger with a bit of a braggart inside. Anyone else? Accept no one’s definition of your life; define yourself. Well, now it is time for definitions. We’ve found the word, decoded the word, looked at the parts to learn more about the word, done activities to get to know the word, and talked about and used the word. The word should be our word now. It is time to tell what it means. When students define words they shouldn’t spout words found in a dictionary. They should be able to explain, make connections, use analogies, and draw the word. It is OK, I think, if some of our quizzes involve matching new terms and their meanings, but it is only OK if the meaning that the students have actively built in their heads will be able to be matched to the words on the quiz. Students should never be asked to memorize new words and definitions with little or no regard to meaning. The words will never be retained and never be used. Time and paper will both be wasted. It is better for the new words to be used and tested in real context. It is much better for the words to become an established part of the student’s vocabulary. It is best for students to assimilate words as their own for life. This activity could be a weekly addition to a vocabulary journal. Students should be given the opportunity to share their new words with classmates, family, and any other interested learner! More vocabulary development to come. Do you ever feel like Yogi Berra in your classroom? There is so much talking, how can there be any learning? I wonder at times, being a strong intrapersonal learner, what prompted me to be a teacher. I love quiet. I love calm. Fortunately, I can put that aside for my commutes and computer time. I understand that students need to talk to cement their learning. My kids speak to their shoulder partner no less than 10 times a day. And I listen in and am amazed almost daily by their insights and their learning. In our daily poetry moment, the kids first predict the type of poem based on the title and a quick glance. They use complete sentences (learned by having stems on the whiteboard for as long as it takes to learn) to explain their thinking to their neighbor. Everyone gets a chance to talk. To train them, I sometimes have the partner closer to me go first or the partner closer to the door, etc. Next, we look at the poem and describe what we see and what new ideas we have with our partners. Then, we read the poem and add to what we know. Finally, students answer questions about the poem… setting, theme, author’s purpose, new title, what a certain line means, etc. Often I sum up what I am hearing by bragging about the great thinking that is being expressed. Another great source for vocabulary discussion in my class is Alphaboxes. I am including a generic form for this. I have made subject specific ones, but truly a piece of paper or student sized whiteboard works just fine! This activity can be done before a new unit of study, say frogs, everyone independently tries to fill the alphabet boxes with one or more word about what they already know about frogs. After 5 – 10 minutes of quiet time (I have to have some sometime), the students pair with their shoulder partner, sharing ideas and adding to their boxes. Again after 5- 10 minutes the pairs are asked to form squares by 2 pairs “squaring” up and the last conversation ensues. When the kids are all done talking, we quickly run through the alphabet shouting out words. This part is fun! It is also a good time to throw in any words that go with the unit that no one thought of. This activity also works well at the end of a init of study. As you listen in you will see which of the vocabulary words of importance the kids are remembering. This may be my very favorite “D” word, so I would love some discussion about how you use conversation in the classroom or if you would be interested in trying mine. Younger students need to have the magic of multiplication broken into little pieces of reality! I think the best starting point is showing that multiplication is repeated addition. If I add two 6 times, I have multiplied two by six. It actually takes saying that word “times” quite a few times before everyone catches on to the idea that we also say “times” when we multiply. Of course, by showing I actually mean showing. Students need manipulatives in their hands. If they are edible all the better! 15 candies in one roll of Smarties. If everyone on your team has one roll, how many candies does your team have? We make arrays out of cubes, then we draw the arrays with circles or Xs. Sometimes we get fancier and do hearts or stars, but it is important to be able to draw quick arrays to see that they can be useful in problem solving when you get stuck on a problem. Important vocabulary surrounds multiplication. I love to have them figure out the analogies such as, plus: addition :: times: multiplication and addend: factor :: sum: product. Later on, we realize addition: multiplication:: subtraction : division. Besides factor and product, there’s other important multiplication vocabulary or key words. Each and every usually mean to multiply. I tell my class to watch out for same number and equal groups, because those words change each and every to division, every time. Kids need to know the words twice, double, triple, and quadruple means to multiple. Then we have total and altogether, which they already recognize as addition words. These words provide a chance to reinforce the idea that multiplication is actually just FAST addition. When learning our facts, we use many strategies: fact families, number lines, repeated addition, arrays, groups, sets, music, movement, discussion, breaking apart numbers. 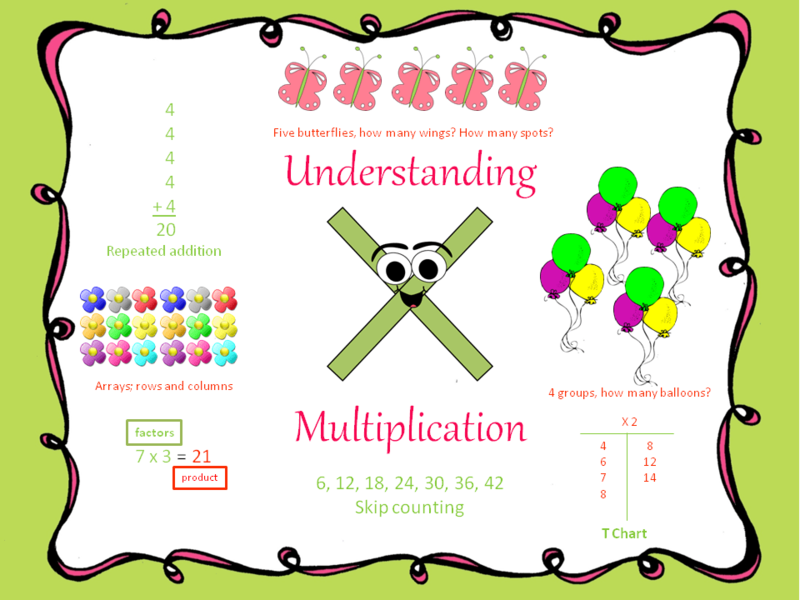 I made this poster for my kids to discuss all the ways they know to multiply. I have attached the pdf for you. It also explores multiplication as repeated addition, arrays, skip counting, and fact families. I hope that you find some magic in multiplication in your classroom!